LOS ANGELES, Calif. /California Newswire/ — Holomic, LLC has been innovating mobile diagnostics for over 5 years, and continues to commercialize technology aimed at improving diagnostics in an ever-increasing environment that mandates on-demand, point-of-care and remote solutions. In this spirit, Holomic announced today the launch of their new corporate trademark, CellMic, LLC in a show of dedication to this mission. 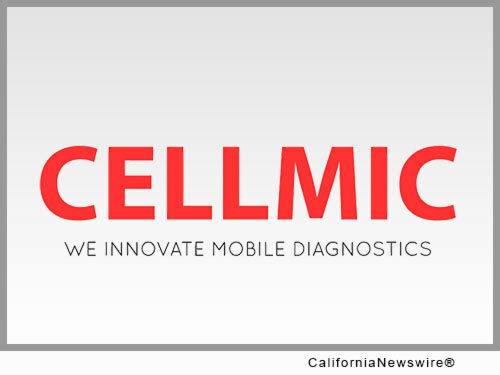 Dr. Neven Karlovac, CEO, states "We are very excited about our new rebranding as CellMic to show our commitment to utilizing consumer mobile and cellular technologies as critical components of complex medical and scientific devices capable of bringing advanced diagnostics to people anywhere in the world, regardless of geographic barriers and constraints." In doing so, CellMic is responsible for bringing the familiarity, simplicity and cost-effectiveness of consumer electronics to many industries for complicated scientific applications. CellMic is derived from "Cellular" and "Microscopy," which accurately describes much of their technology portfolio commercialized via out-licensing of intellectual property from the lab of Dr. Ozcan at the UCLA campus adjacent to the CellMic office. "We will be showcasing some very exciting new mobile technologies this year, all based on cellular platforms," notes Dr. Karlovac, "and in doing so we look forward to taking these tools to the global marketplace across multiple industries, including medical, agricultural, cosmetics, defense and veterinary." CellMic was spun-out of the lab of Dr. Aydogan Ozcan as Holomic, UCLA Chancellor's Professor in the electrical engineering department, in 2011 for the purposes of commercializing the technologies developed therein. Since then, Holomic has been most notably successful at commercializing their HRDR rapid test reader which improves the sensitivity and accuracy of analyzing rapid diagnostic tests in the field. Currently, these readers are used in many countries across the globe, and the company continues to partner with organizations to expand this reach. In addition to their test readers, they also retain many other patent licenses for additional cellular-based technologies developed in Dr. Ozcan's lab.